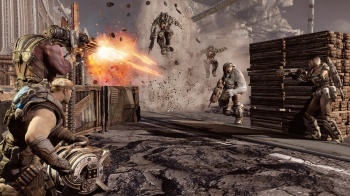 Chris Wynn is the latest Gears of War developer to seek greener pastures. Chris Wynn, Gears of War producer, is the latest member of Epic to flee the coop. In a Twitter reveal, Wynn announced that he was going to work on Mass Effect, as Senior Development Director at BioWare. This puts Wynn in a pretty sweet seat as far as Mass Effect is concerned; he'll be key in shaping the future of the franchise. The last time anyone from Epic ran off to join the circus, it was Mike Capps, former president. Before that it was executive producer Rod Fergusson, and design director Bleszinski. Before Wynn went to Epic, he was Lead Producer at Microsoft, which he left in 2010 to work on Gears of War. As for Mass Effect, there's not much to say. It's still as unformed as it ever was, and after announcing that BioWare had plans for another full game, the developers have yet to really let slip any details about it. "Where to go next" was the question on everyone's lips last September; maybe Wynn has some ideas?